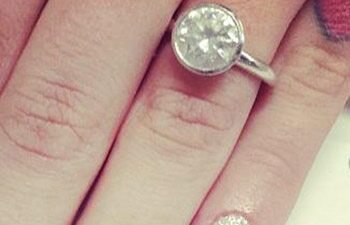 Kelly Osbourne gave us a glimpse of her gorgeous engagement ring this weekend after posting a photo of her funky new manicure on Instagram. The newly engaged star’s rock could be seen prominently sitting on her left ring finger as she flaunted her glittery nail polish. In the July 29 issue of Us Weekly, Kelly, 28, reveals Mosshart, 29, proposed on a balcony overlooking the ocean on Jan. 1 in Anguilla. They waited to tell the world about their engagement, she says, until her sparkler was ready. Kelly says her parents were the first to know about her engagement. “She was just really happy,” she says of mom Sharon Osbourne, 60. Whose engagement ring do You like more? This entry was posted in Celebrity Engagement Rings, Diamond rings, Tiffany Engagement Rings and tagged diamond engagement rings, engagement ring, Kelly Osbourne, tiffany engagement rings on July 23, 2013 by erika.